I really liked Croteam's narratively complex puzzle game The Talos Principle, and fortunately for my self-esteem, so did Chris when he played it for our review. I was thus very excited about the March announcement of an expansion called Road to Gehenna, and today we finally got wind of the release date: July 23. 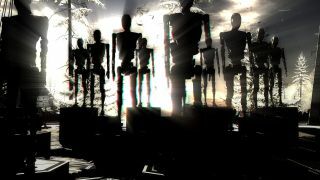 The Talos Principle: Road to Gehenna will unfold over four chapters with "some of the most advanced and challenging puzzles yet." Players will take on the role of Uriel, Elohim's messenger, as he tries to free the souls trapped in the game's strange, mysterious world. The expansion will feature new characters and a new world with its own unique history and philosophy, created by Tom Jubert and Jonas Kyratzes, the writers of the original game. The Road to Gehenna expansion will be out on July 23. More information will be available on Steam when this link goes live—in the meantime, enjoy some screens.